Let me remind my dear readers that I was born in 1928, that is, I was to live in Stalin’s hell on earth. Created in pre-Soviet Russia were works of genius (such as those of Tolstoy, Dostoyevsky, or Chekhov), which were translated into the languages of all culturally advanced countries. The Russian classical music also impressed the West. Science, philosophy, and other fields of culture were developing and promised a no less significant future than in the most culturally developed countries. 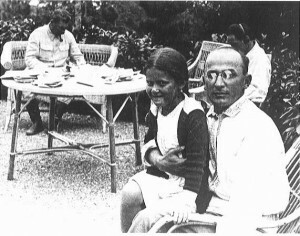 Stalin in the background and his daughter Svetlana sitting on the lap of Lavrentiy Beria. My father was a writer. As such, he was a member of the Union of Writers. When Hitler’s Germany attacked Russia, Hitler sent into the country troops of motorcyclists equipped with machine-guns. My father volunteered for a Russian volunteer army; he was killed by a German machine-gun mounted on a motorcycle. Installed in the Club of the Union of Writers in Moscow is a memorial marble plaque honoring the names of the writers who had been killed during the Hitler invasion, each name engraved in gold. My father’s name is among them. My mother was a distinguished medical doctor, with a PhD in neurology. Both parents loved me. But while my father took care of my mind, my mother protected my health. Stalin (from the Russian word which means “steel”) died in 1953. His method of ruling Russia was simple. A multitude of domestic spies were listening secretly to what was said in private and then reported it to those on top at the People’s Commissariat, that is, the Ministry of Internal Affairs. The so-called “criminal” would be arrested, confessed under torture to allegedly saying things he may not have said, and shot or sent to a concentration camp to work and die there. Meanwhile, mentally an idiot, Stalin was building a country able to withstand and counterattack Hitler’s Germany. Having sustained heavy losses near Stalingrad and unable to resist Stalin’s forces summoned from Siberia, Hitler’s army was being chased out of the country, beyond the Russian border, and onto the German soil. Having lost the war, Hitler committed suicide. In 1953, Stalin died, and the new era began. The power in the country was changing hands. With the change of the regime, 17 years after Stalin’s death, I and my family finally got a chance to leave the country. Imagine the unimaginable — we were on our way to the United States! And erelong we moved into our spacious apartment on the 21st floor, overlooking the horizonless Van Cortland park, stretching as far as the eye can see. “The Education of Lev Navrozov recreates the life of a spiritually isolated individual inside a vast, omnipotent machine-like society — cruel, barren, and destructive. Navrozov writes with a sensitivity long missing from Russian letters: ‘As if Proust had somehow blended with Orwell,’ says Robert Massie, author of Nicholas and Alexandra. I have been trying to educate and save the free West — no, not from Russia under Stalin, but from the new and even more dangerous monster such as Mao’s regime, which he called the People’s Republic of China (PRC). The similarity is obvious. Countries like Stalin’s Russia or today’s PRC produce as powerful weapons and armies as they possibly can. The size of the population of the PRC (1.3 billion people) will enable the PRC to create a military power far surpassing that of any other country. It is no accident that Russia, with its formidable growth of power under Stalin, is now not being able to contain the former territory and is making concessions to China, its mighty neighbor, who is chipping away from it the Far East, Russia’s soil rich in oil and mineral resources. Which world country can stop China’s “peaceful” expansion and eventual takeover of the world, equipped as it is with the latest Western technology, the know-how stolen from the West, plus its population of 1.3 billion?